Background Laryngeal fracture is a rare condition that can lead to significant problems with airway patency, voice production, and swallowing. Conflict in the literature exists regarding the most suitable way to manage this injury. Case Report We present the case of a 29-year-old Caucasian man who sustained a displaced fracture of the thyroid cartilage due to blunt trauma. He reported no swallowing, breathing, or voice problems after 1 year, and his recovery can be attributed to the early recognition and proper management of his condition. Conclusion This case illustrates the importance of ensuring a high level of suspicion for laryngeal fracture in the acute trauma patient. Early identification of this injury allows early intervention that not only protects the airway but also improves long-term voice and airway outcomes. A 29-year-old Caucasian man was competing in a triathlon when he fell off his bike and struck his chest and anterior aspect of his neck on a metal pole. He was taken to the nearest emergency department and was noted to have multiple abrasions and some hoarseness of his voice. 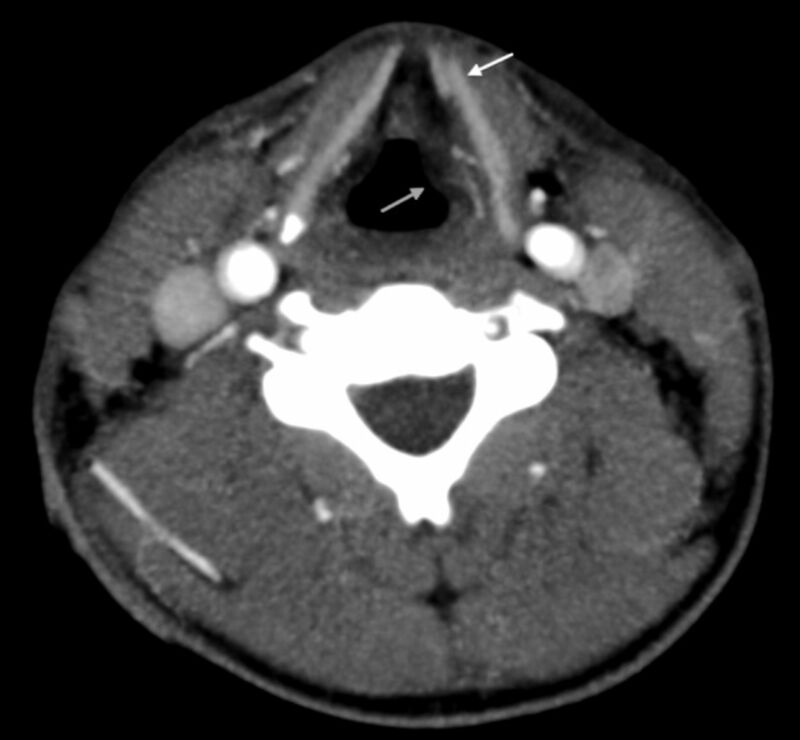 A laryngeal injury was suspected, so a computed tomography (CT) scan was obtained that revealed a fracture of the left lamina of the thyroid cartilage (Figure). He was taken to the operating room and underwent an open reduction and internal fixation (ORIF) of the thyroid cartilage with miniplates. He was admitted to the intensive care unit (ICU) and extubated on postoperative day 2 without the need for tracheostomy. Video stroboscopy performed 2 weeks after the event was unremarkable, and he reported no swallowing, breathing, or voice problems after 1 year. Displaced fracture of the left lamina of the thyroid cartilage shown on a computed tomography scan. The left lamina is displaced anteriorly 0.7 cm (upper arrow) with airway narrowing caused by fullness of the vocalis muscle secondary to decreased length from the anterior commissure of the larynx and arytenoid (lower arrow). Laryngeal fracture is an infrequent injury due to the high mobility of the larynx and the protection it receives from the surrounding bony structures of the sternum, mandible, and cervical spine.2,4 Blunt external trauma to the neck from motor vehicle accidents, sports-related trauma, assault, and strangulation is the most common cause of laryngeal fracture.3,4 Penetrating trauma is the second leading cause, often due to gunshot or stab wounds to the neck. This case illustrates the importance of ensuring a high level of suspicion for laryngeal fracture in the acute trauma patient. Early identification of this injury allows early intervention that not only protects the airway but also improves long-term voice and airway outcomes. (6, 1992) The acute management of external laryngeal trauma. A 27-year experience. Arch Otolaryngol Head Neck Surg 118(6):598–604, pmid:1637537. (9, 1993) Acute laryngeal trauma: a review of 77 patients. Otolaryngol Head Neck Surg 109((3 Pt 1)):441–449, pmid:8414560. (7, 2011) Management of laryngeal fractures—a 10-year experience. J Voice 25(4):473–479, pmid:20236793, Epub 2010 Mar 17. (5, 2005) Acute external laryngeal trauma: experience with 112 patients. Ann Otol Rhinol Laryngol 114(5):361–368, pmid:15966522. (10, 2011) Optimal timing of surgical intervention following adult laryngeal trauma. Laryngoscope 121(10):2122–2127, pmid:21898446, Epub 2011 Sep 6. (2, 2008) Laryngeal fractures: clinical findings and considerations on suboptimal outcome. Acta Otolaryngol 128(2):213–218, pmid:17851956. (9, 2012) Analysis of clinical feature and management of laryngeal fracture: recent 22 case review. Yonsei Med J 53(5):992–998, pmid:22869483. (6, 1986) Laryngotracheal trauma: a protocol approach to a rare injury. Laryngoscope 96(6):660–665, pmid:3713409.